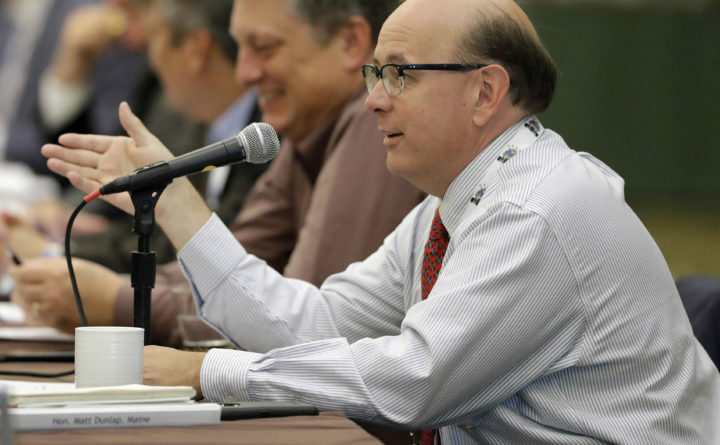 In this July 8, 2017 file photo, Maine Secretary of State Matt Dunlap speaks during a voter registration meeting at the National Association of Secretaries of State conference in Indianapolis. Dunlap released proposed rank choice voting rules on Wednesday, March 28, 2018, and announced that the window for the public to comment on them will end on April 6 so his office will have time to prepare for the June 12 primary election. Rules for how Maine will count votes this June in Maine’s first ranked-choice voting election are on a fast-track to approval by Secretary of State Matthew Dunlap. Dunlap released proposed rules on Wednesday and announced that the window for the public to comment on them will end on April 6 so his office will have time to prepare for the June 12 primary election. This marks the first time in U.S. history that a state has used ranked-choice voting in statewide legislative and gubernatorial primary elections. — The secretary of state will have the authority over ballot design. The rules state that ranked-choice contests — meaning any contest that has more than two candidates — will be grouped together on ballots or possibly be put on a separate ballot. — Voters will be allowed to rank every candidate if they wish, including declared write-in candidates, or just vote for one. — At the end of each round of counting, if no candidate receives a majority of the votes cast in that round, the last-place candidate is eliminated and the next-highest ranked continuing candidate on the defeated candidate’s ballots is added to the totals for the continuing candidates. Counting stops when a candidate receives one more vote than 50 percent of the total votes cast among the continuing candidates who are left in a given round of voting. — If a voter marks more than one candidate with the same rank, the ballot will not count. If a voter leaves out a rank — for example, ranking candidates with 1, 2 and 4 — the counting will continue with subsequent rankings. If a voter skips two rankings, the ballot will not count. — If voting officials deem that a ranked-choice tally is necessary, officers from the Department of Public Safety will be asked to retrieve paper ballots and/or memory devices and bring them to a central counting location in the Augusta area. All security measures currently in place for the transportation of ballots, including tamper-evident seals and a system of documenting their handling, will be used. — Any machines used for counting or computers used for tallying will not be connected to the internet or internal networks and will not have wireless transmittal technology. Dunlap said in March that long-term, the cost of implementing the system could exceed $1 million a year but probably won’t cost that much for the June primary. A citizen-initiated petition led to a 2016 referendum in which Maine voters approved use of the system, but the Legislature enacted a law in 2017 that called for an amendment to the Maine Constitution before the system could be used. Under that law, if that didn’t happen by December 2021, the ranked-choice voting system would be nullified. However, supporters of ranked-choice voting launched a people’s veto petition of the Legislature’s law, which was certified as valid by Dunlap in March. That petition forces a question on the June ballot asking whether voters want to cancel the Legislature’s law and put ranked-choice voting in place for the long term. Meanwhile, supporters filed a suit in Kennebec County Superior Court last month seeking to ensure ranked-choice voting is used in the June primary, which could be moot if Dunlap’s rules are implemented. “These rules should start to put in perspective the massive change that has been instituted in our election process,” Mason said in a written statement. In a related development, the Maine Ethics Commission voted unanimously Wednesday to start its own rulemaking process to define how public campaign financing will work after the primary if it takes days or weeks to determine a winner.